Kate Greenaway, English artist and book illustrator, was born in London on March 17, 1846. She was the daughter of John Greenaway, a well-known draughtsman and engraver on wood and Elizabeth Catherine Jones, a seamstress and children’s clothing designer. Her early education included life drawing and watercolor painting classes at Heatherleys in Chelsea and at the Slade School of Fine Art. 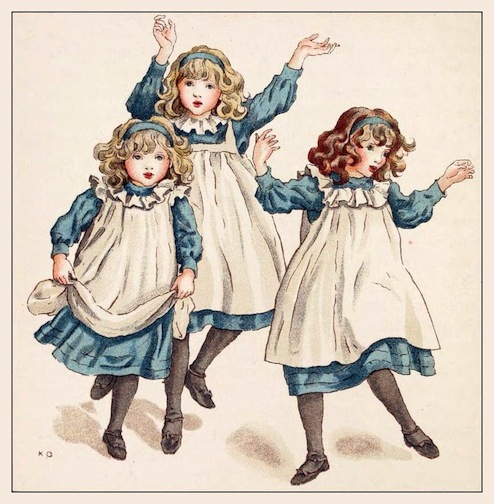 She began to exhibit her drawings and watercolors in 1868 at London’s Dudley Gallery, and her first published illustrations appeared in such magazines as Little Folks. With her father’s connections in the trade she was able to convince Edmund Evans, a well known color printer, to publish her first collection of poetry and drawings, Under the Window, in 1879. He was able to translate all the charm of Greenaway’s idyllic pastoral scenes to paper through a costly process that involved the photographing of her dainty water colors on to wood blocks. Against expert advice Evans published only 20,000 copies which immediately sold out and a second printing of 70,000 was produced.